Bruce Lehmann is the Founder and Administrator of WBandD (which I co-administer with him), a community for worldbuilders that is focused on VRML and X3D, but also welcomes any other platform. Is a good start point for those who don't know VRML/X3D, and an excellent meeting place for the expert ones. - What motivated you to create WBandD? 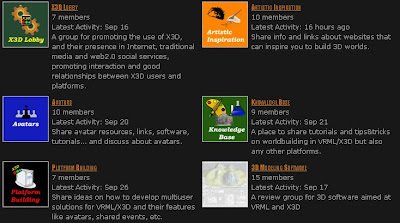 - With the Outers (The Blaxxun Free Server) going down and possibly not coming back, and the advent of new multi-user ideas I felt it was a way for those of us who build, develop or just plain interested in VRML and X3D to be able to keep track of each other and to share worlds and ideas. - What can worldbuilders find if they join to WBandD? - Most anything they want. There are links to worlds, discussions, blogs, and I hope, as it grows, to be able to add anything anyone asks for. I have another site that reviews modeling software related to VRML and I am considering updating elements of it and adding it to the site. - What are the main problems that worldbuilders are more worried about nowadays? - Protection of content. Most of the people I know, including myself, are willing to share ideas and even files to help others learn. But, there is always the threat of others stealing content that is not theirs or using content without giving the creators proper acknowledgment. The fair balance of that is a big issue. Also to some, a way to showcase their creations or test out new ideas. - Why did you choose VRML/X3D as main platform for the community? - Simply, it is the platform I, and the others on the site work in. I am a member of other forums and sites that are related to 3D and virtual reality, but they by their nature are broad-scoped and VRML/X3D seems to get shoved to the side. Right now there is a large interest in 3D and Virtual Worlds and I didn’t want one of the original platforms to get lost in the shuffle. - What do you think that the community of builders in VRML/X3D needs more nowadays? - An outlet or platform to share their worlds and creations. 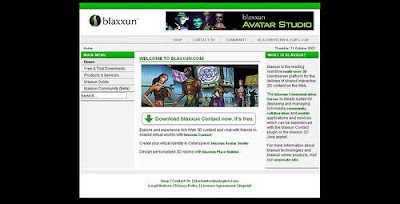 It used to be done using the Blaxxun Developer server. But it has since gone down, and might not be available anymore. And, of course ways to communicate ideas and concepts with others. - What are the virtues of VRML/X3D for building 3d worlds compared to other systems? - Open standards to begin with. Ease of use. It is a fairly easy to learn method when compared to some of the other platforms. It is a friendly format, meaning that it is a fairly common saving/exporting convention in most 3D modeling programs, which means that you’re not locked into a proprietary format or in-world building. I personally prefer to create in my program of choice and then make it usable in a virtual environment. VRML and X3D make this much easier than the others. And as an ISO Standard, it has support and specification availability. - In a world where new technologies and virtual worlds emerge constantly, what do you think that VRML/X3D worldbuilders should do with priority? - Investigate and support new platforms that are utilizing this platform. There is a lot of untapped knowledge and talent out there and, when used properly and fairly, would tremendously enhance some of the emerging ideas. - Depends on who is claiming it is and what they are offering in its place. I list four active VRML based communities on WBandD. There is a new community that has recently come on-line, and another that is planning to re-open soon. Granted, they are not as active as they have been in the past. The fact is, they are still on-line and being used. VRML in itself has evolved into X3D and is being widely utilized. It is not the major player anymore, but it is certainly not dead yet. There are new ideas that use this platform coming up as we speak. Some of the other platforms appear to be the “de-facto” king of virtual technology merely by their own claims and sheer numbers. - In your opinion, what were the mistakes that the VRML community did in the past that made the adoption of this technology lesser than expected? - Some have not grown with the changing times. Communities need to be dynamic in order to grow and improve. Especially when new platforms come out that are better looking and provide a richer experience. There are, however, some communities that are now offering new ideas, more freedom to build/upload worlds and objects, in-community movies, radio, etc. The thing to remember is that there are people out there that merely want to experience virtual worlds and chat or interact in them. They have little interest in how it works or why, but merely want to go and enjoy it. These are the people who will make or break your platform as far as popularity goes. Also, the apparent dis-interest exhibited by some of the companies that used to provide server software, etc utilizing this platform has given rise to the idea that this is a “dead” issue. - And what can do the X3D community of users and developers to get a deeper diffusion? - Get actively involved in the new platforms coming up. Either by using them or contributing to their content. There are people that are skilled in server development, and others that excel in content creation. Part of providing WBandD is to help them keep in contact with each other. - Do you think that the community of worldbuilders is enough united or organized? - What are your medium and long term aims for WBandD? 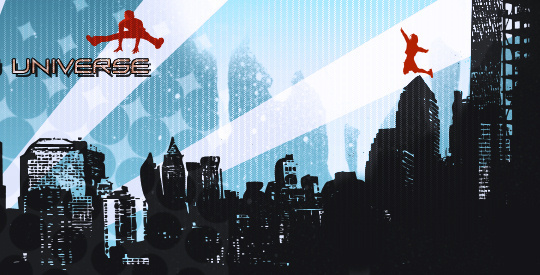 - To have the site available to all who want to utilize it. Where it goes and how it grows depends on the members who participate in it. Also, if the right platforms come out, it could be a centralized location to share and visit the worlds we create. As long as people wish to use it, I am happy to provide it. "Be the first to comment!" Thanks Alain for your comments. X3D needs a serious marketing promotion, I think. It's obvious these people have a huge interest and passion even for virtual worlds, after reading your post I wonder why they don't use their programming knowledge to contribute into an open standards project like Opensim which received an award at the virtual worlds expo this year for being the most innovative platform. If you have programming knowledge and a passion for virtual worlds I would invite you to take a look into Opensim if you haven't done already. In fact, they're doing it. They use their programming knowledge to contribute into an open standards project: X3D, the ISO approved standard for 3D on the web. OpenSim combines many standards, and is announced like an "industry standard", which is as you say, a combination of standards that hopes to be a de-facto standard. It may be welcome on WBandD too, as we said, WBandD has focus on X3D but is also open to other platforms. And if OpenSim uses it too, much more. I find OpenSim very appealing, and will cover it in the future, and also communities already built with it. Any suggestion is welcome.